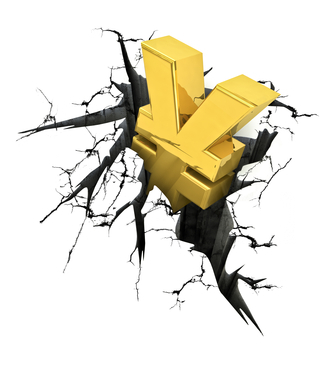 Japan is in a recession, and the Japanese yen lost 15% from the highs against the U.S. dollar. The decline should continue this year as well. The potential target could be 104 in the futures prices. 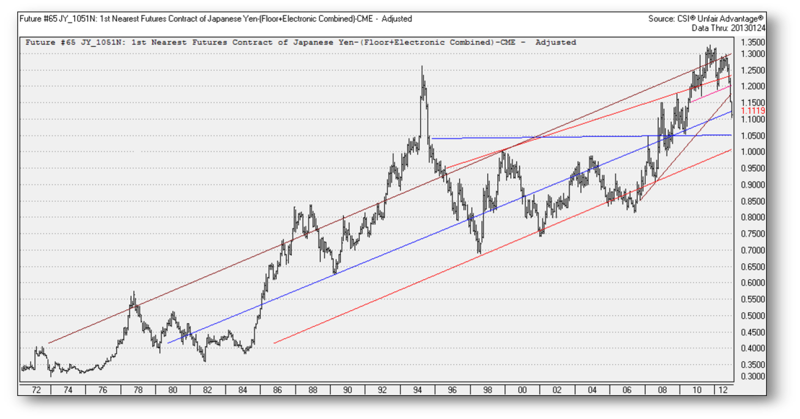 However, the longer-term picture supports a new rise of the Japanese yen. The Chinese economy has probably bottomed. The decline of the yen boosted profit margins, which rose more than 2.0%. Nonetheless, the balance of trade is in the red at -801 billion. Japanese export volumes declined 0.4% in December after having increased 0.2% in November. Overall, they fell more than 5% in the fourth quarter of 2012 compared to the previous quarter. World economic activity is trending again, but Japanese activity is nonetheless contracting. Why? Japan is massively importing fossil fuels, since all but two Japanese nuclear power stations have been closed following the nuclear problems in Fukushima. In addition, territorial disputes with China are hurting business. In fact, exports to the Asian giant were almost 16% lower than in 2011, while they are slightly improving with the E.U. and the U.S. In 2012, the Chinese GDP rose to 7.9% from 7.4%, probably marking the end of the recession of the past two years. Short-term expectations are for Chinese growth to stabilize around these levels, supported by a moderate recovery in property and investment spending. Chinese exports rose with the U.S and the E.U., but they fell about 7% with Japan. In an effort to tackle the crisis, Prime Minister Shinto Abe has decided to adopt some extreme measures. Starting in 2014, the Bank of Japan (BoJ) will buy about JPY 13 trillion every month in long-term securities and T-bills. The BoJ also announced last week that the supervision of macroeconomic policy was transferred to the Council on Economic and Fiscal Policy. The council includes ministers, business leaders, academics and the BoJ governor. The decision, which ends the independence of the Bank of Japan, is already producing some discrepancies from previous monetary policies. For example, in opposition to BoJ governor Shirakawa, who fears a rise of long-term yields and a decline of Japanese stocks, the council increased inflation target to 2% from 1%. In reality, consumer prices were unchanged in December, with only the energy sector showing some increase due to the usage of the expensive fossil fuels. Household costs are still moderate, and wages might rise this year. Nevertheless, financial markets can react faster to the new target of 2% by putting pressure on Japanese bond prices. The USD/JPY is set to decline to 104-100 (futures prices) this year. Nevertheless, the long-term picture is still supportive for the yen against the U.S. dollar. Let us see why. In the past, the USD/JPY rose for 40%–50% (4–5 years) from the lows (40-85 and 63-126) before topping, then corrected for 25%–30% (2–3 years) from the highs (84-62). The full cycle (five waves from 1984 to 1995) expanded for 65%–75% (40-126) and lasted for 8–10 years before turning down. The bear cycles continued instead for 44% (126-70) and 38% (56-35). They trended for 7–11 years before bottoming (1978–1985 and 1995–2007). How does this fit in the current scenario? The USD/JPY bottomed in 2007 at 82 and rose until 2011 (4 years) at 132 (39%). The correction should last 2 years and expand for about 25%.